KERA is covering the impact of race on a rapidly diversifying region – in education, poverty, the arts, the criminal justice system, health care, voting rights and other areas. We're also exploring the intersections between race, class, gender and identity. For in-depth interviews and discussions, listen to Think with host Krys Boyd. For stories about race in the cultural world, visit Art&Seek. Follow these first-generation Texans and the educators weaving them into the American tapestry in our multimedia series, Generation One. A statue of Robert E. Lee was at the center of the white supremacist rally last weekend in Charlottesville, Virginia. Cities across the U.S., including Dallas, are now renewing debate on what to do with existing Confederate memorials. Opal Lee has lived 90 pretty remarkable years -- from the night, when she was a kid, that a mob of white protesters drove her family from their Fort Worth home, to her symbolic walk to Washington, D.C., last fall to make Juneteenth a national holiday. Two years ago, Ana Zamora was on top of the world. She’d written a letter to then-President Barack Obama, and he invited her to his State of the Union address. In January, the Metro Dallas Homeless Alliance led its annual homeless count. The final numbers aren't in, but advocates say they expect the numbers should be similar to last year’s – including the fact that in Dallas, the homeless population is disproportionately black. A police dashcam video released five months after a Texas officer shot a black man appears to show the man walking away as the officer fired, and the man's lawyer says he was not a threat. Fort Worth officials are calling for patience during the ongoing investigation of a viral video of a white Fort Worth police officer wrestling a black woman to the ground before arresting her and her teenage daughters. Fort Worth police are investigating a white officer shown in a viral video wrestling a black woman to the ground Wednesday before arresting her and her teenage daughters. Many think of Latinos as people with roots in Mexico, Cuba or other Latin American countries. That definition, though, leaves out Filipino Americans, whose culture was shaped by centuries of Spanish colonial rule. Historically, a majority of African Americans in the U.S. have voted Democrat. On Think, Krys Boyd talked with Corey D. Fields of the Center for Comparative Studies in Race and Ethnicity at Stanford about African Americans who lean Republican. How you feel about Black Lives Matter might depend on your own race. It can also depend on what generation you belong to. All week as North Texas students returned to school, we’ listened in on conversations about race with parents, teachers and students. On Think -- as part of KERA’s American Graduate series “The First Week” -- Krys Boyd spoke to a panel of child psychologists about ways to help young people process the racial violence that occurred across the country this summer. Over the next five days, in a series called "The First Week," we’ll listen in on the conversations students, parents, educators and police officers are having after a summer of racial turmoil in the U.S. and police shootings in Dallas. First, we look at race through the perspective of a black family in Arlington. In the ongoing conversation on race and identity, we don’t hear much about how white people experience their race. But in the Whiteness Project, candid video interviews explore what it means to be white today. A report released earlier this month reveals some uncomfortable truths about child poverty in Texas. For example while 1 in 4 Texas kids live in poverty— for black and Latino children, it’s 1 in 3. KERA took a deep dive into the State of Texas Children, produced by the Center for Public Policy Priorities. Democratic presidential candidate Bernie Sanders made a campaign stop in Dallas on Sunday. That followed his appearance at an event in Arizona, where he was interrupted and heckled at the Netroots Nation conference. 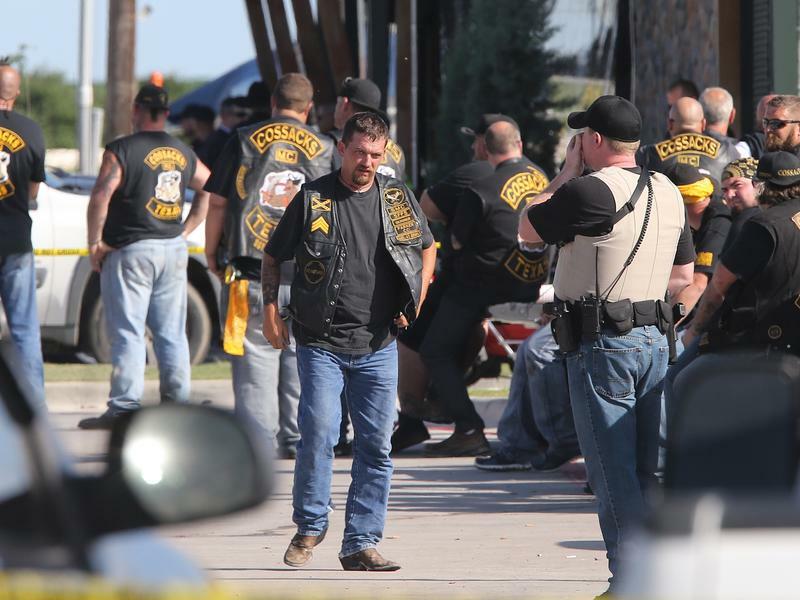 The biker gang shootout this weekend in Waco, Texas, that left nine people dead, 18 wounded, and as many as 192 facing organized crime charges has sparked a lot of scrutiny over how police and media are treating this incident compared with how they approached the protests in Ferguson, Mo., and Baltimore. Sixty years ago, the movie Giant brought James Dean to West Texas for the last film he'd ever make. Giant introduced audiences to a tiny town called Marfa - and to aspects of the Mexican-American experience not yet seen on the big screen. Hector Galán, the director of a new documentary called Children of Giant, talked to Krys Boyd about the epic film's turning point. Update, 4:48 p.m.: Civil rights activist and singer Bernice Johnson Reagon is the keynote speaker at Facing Race, a national conference of inter-generational activists, students and teachers working towards racial justice in the United States. Study Up For 'Think': Redefining "A Chinaman's Chance"
The United States Census Bureau reported that Asians were the fastest growing race or ethnic group in 2012, with a growth rate of 2.9%. But as the Asian American population continues to grow, what does it mean to identify as a part of that group? Today on Think at 1 p.m., Citizen University founder and former Clinton advisor Eric Liu joins Krys Boyd to talk about his new book A Chinaman’s Chance: One Family’s Journey and the Chinese American Dream. Imagine seeing your parent shot to death in what may have been a misunderstanding because of race. That’s the story of one woman who has helped organized a conversation about race and education. It took place Thursday night in Dallas at the Bishop Arts Theatre Arts Center. Should colleges leave race out of the admissions equation? While support has increased for affirmative action programs in America the past several years, civil rights advocate Sheryll Cashin has another idea: schools should consider where an applicant grew up instead of the color of his or her skin. She joins Krys Boyd at 1 p.m. to discuss her new book, Place Not Race: A New Vision of Opportunity in America. A white woman who claims the University of Texas improperly denied her admission because of race is getting a second hearing today before a federal appeals court. The U.S. Supreme Court ordered the 5th Circuit Court of Appeals to take another look at whether the school's race-based admissions policy remains necessary to ensure a diverse student body. The city of Dallas is launching a series of "Conversations About Race" this month. Four public dialogues will lead up to "Dallas Faces Race" next fall -- a national conference in the "Facing Race" series. Mayor Mike Rawlings says the preliminary series is not about racism or discrimination, but to help get a bigger picture of how people perceive and understand the different cultures and ethnicities that make up the city. The first session is scheduled for 10 a.m. Sept. 21 at City Performance Hall, 2520 Flora St.